Estimating the worldwide burden of Group B Streptococcus (GBS) infections in pregnant women, stillbirths and children (2015-2017). Research showing the worldwide Group B Streptococcus (GBS) burden in pregnant women, stillbirths and children is being launched on Monday 6th of November at the annual American Society of Tropical Medicine & Hygiene in Baltimore, USA. The research involved over 100 researchers from more than 30 institutions and was coordinated by the MARCH Centre at LSHTM. The team conducted a ‘landscape analysis’, looking at the global epidemiology of GBS in terms of its contribution to newborn and infant sepsis. The team considered a wide range of outcomes for women themselves as well as newborn and infant disease, stillbirth, neurodevelopmental impairment, prematurity, and neonatal encephalopathy. The research estimated 21.7 million pregnant women to be infected with GBS globally, translating to an average of 18% or one in five of all pregnant women, most of whom are untreated and unidentified. The highest numbers of colonised pregnant women in 2015 were found in India (2.5 million), China (1.9 million), Nigeria (1.1 million), the USA (0.9 million) and Indonesia (0.8 million). 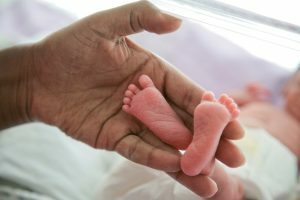 The work has more than doubled previously available data, through comprehensive systematic reviews as well as use of unpublished data from collaborators worldwide, but there are still key gaps, notably for stillbirths (especially in Asia), disability especially after GBS sepsis, and maternal GBS disease. The results estimated within the study are therefore likely to be underestimates of the true burden of GBS. The study investigated the potential of maternal immunisation for reducing the global burden of GBS and showed that a maternal GBS vaccine with 80% efficacy and 90% coverage could potentially prevent 231,000 infant and maternal GBS cases, in turn reducing other outcomes such as stillbirths, deaths and later impairment. GBS accounts for more than the combined neonatal deaths from tetanus, pertussis, and respiratory syncytial virus, for which maternal vaccines are already in use or advanced development. However, no vaccine is currently available for maternal GBS.